ing soil conservation plans in the north Jordan highlands. Jordan is currently suffering from serious soil erosion. hectares in the southern Ghor region. highland falls within 50 - 200, and >200 ton·ha−1·year−1. 3.4 ton·ha−1·year−1 to 13 ton·ha−1·year−1 . servation measures and land management. franja, west of Krayma town. Figure 1. The study area. tured subsoil, which accelerates further erosion [1,24]. catchment and “semi-arid and arid” in the lower parts. in the watershed record 30 - 50 rain days per year . reaching 40+˚C. Frost-days number 5 - 15 per year . tion of fuel and charcoal-wood is an added stressor . displaced, nothing hinders their displacement downslope. in the northern highlands of Jordan. for both agricultural and forested watersheds [30,42-48]. differences in precipitation patterns between regions. where p is the mean annual precipitation. a raster map for R factor. R values in this study were in the range (85.4 - 486.9). K = Soil erodibility factor (ton·hr−1·ha−1·MJ·mm). m = (Silt% + Sand%) × (100 − clay%). a = % organic matter. fairly structured, 3) slightly structured, and 4) solid. shed. Location of these samples was controlled by GPS. Table 2. Rainfall erosivity (R) values. as described by Edmonds et al. .
tion of 30 m was used to calculate L and S parameters. degree is the slope of the standard USLE plot. result of increasing the velocity and erosivity of runoff. plants, and 1 to 9/10 under root and tuber crops [21,56]. posed soil, and thus an increase in potential soil loss. value in each land cell can be specified. according to its P value. Figure 2. The digital elevation model. Table 3. C factor values for different land cover-types. Table 4. Support practices factor (P). Figure 4. 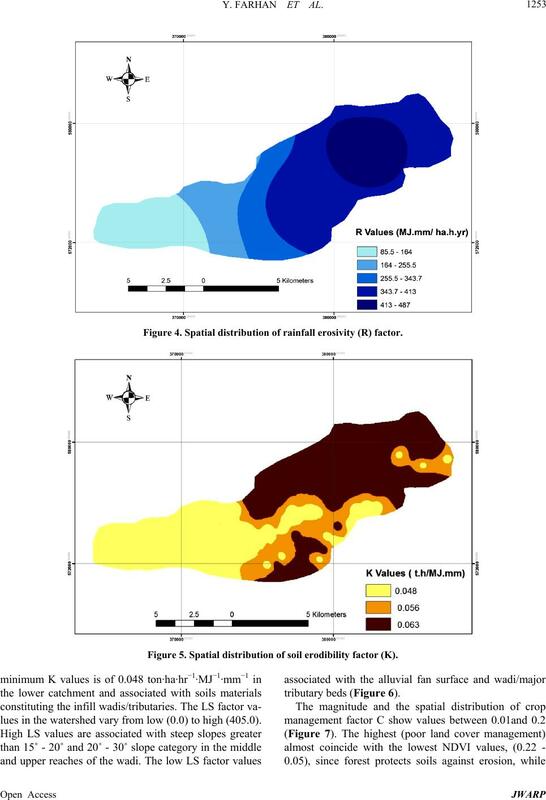 Spatial distribution of rainfall erosivity (R) factor. Figure 5. 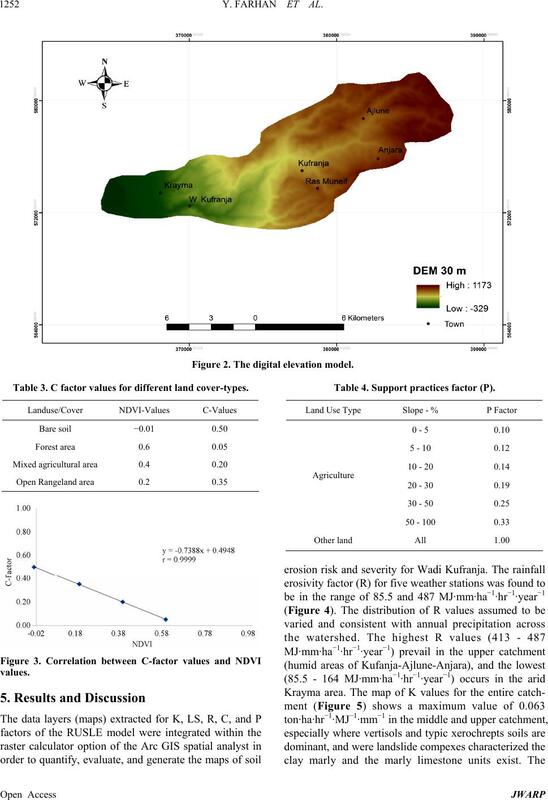 Spatial distribution of soil erodibility factor (K). lues in the watershed vary from low (0.0) to high (405.0). Figure 6. Spatial distribution of (LS) factor. Figure 7. 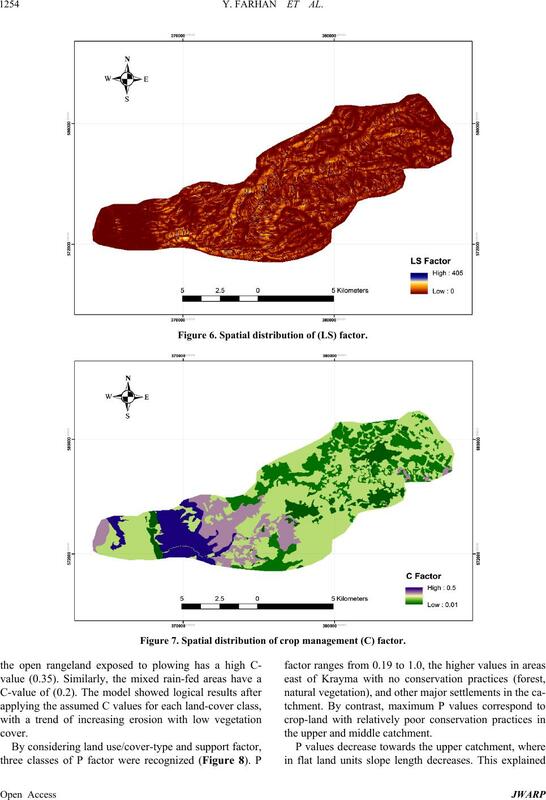 Spatial distribution of crop management (C) factor. the upper and middle catchment. Figure 8. Spatial distribution of crop management (C) factor. erosion risk classes are illustrated in Table 5.
and accounts for 31.2% of the total watershed soil loss. steep slope categories: 10˚ - 15˚, 15˚ - 20˚ and 20˚ - 30˚. Table 5. Area and proportion of each soil erosion risk class. Table 6. Soil erosion severity zones. Figure 9. 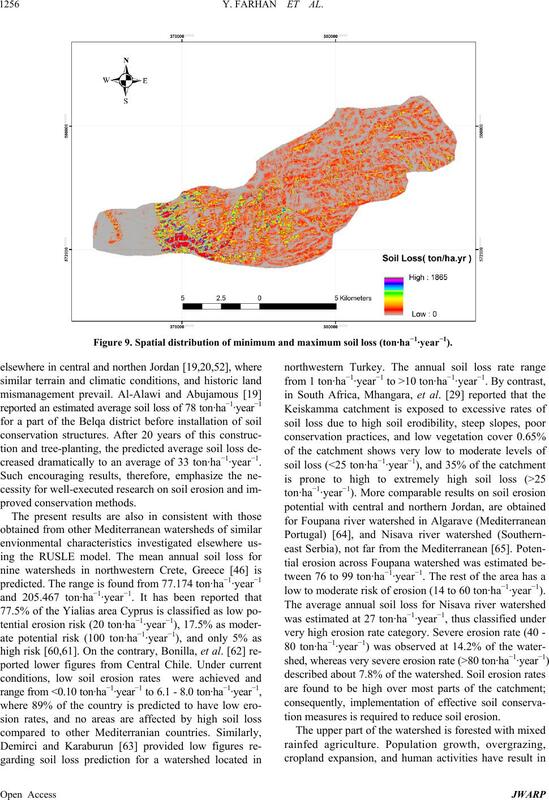 Spatial distribution of minimum and maximum soil loss (ton·ha−1·year−1). creased dramatically to an average of 33 ton·ha−1·year−1. low to moderate risk of erosion (14 to 60 ton·ha−1·year−1). 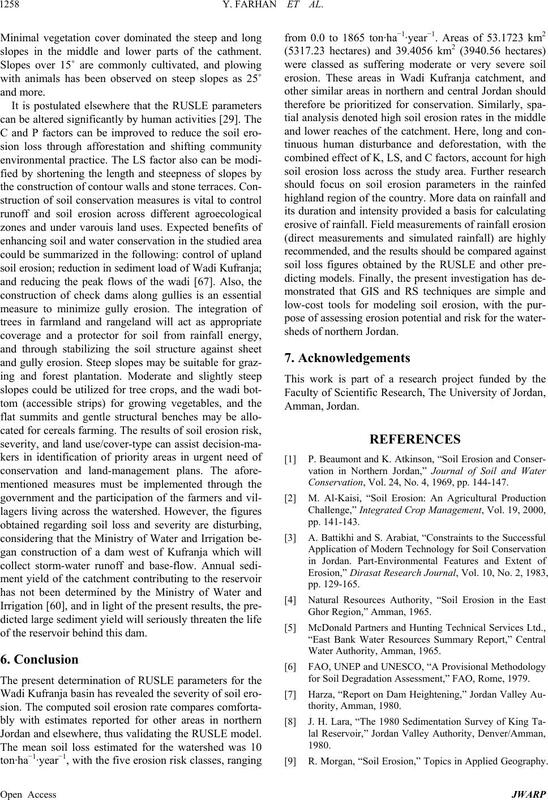 tion measures is required to reduce soil erosion. Figure 10. Spatial distribution of erosion risk categories. Figure 11. 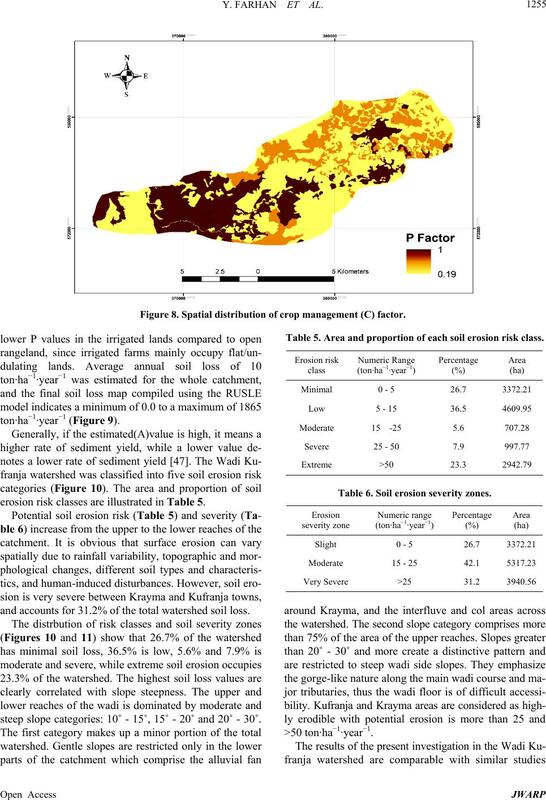 Spatial distribution of soil erosion severity zones. other parts of northern Jordan have been changed . 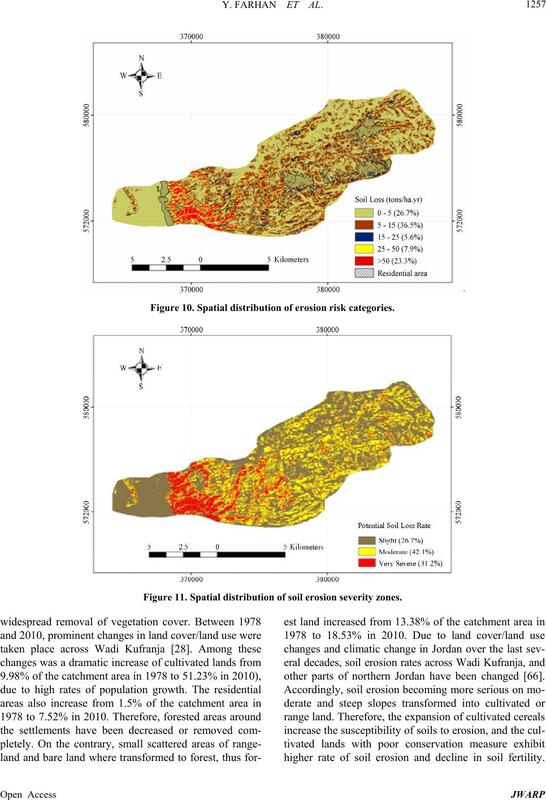 higher rate of soil erosion and decline in soil fertility. slopes in the middle and lower parts of the cathment. of the reservoir behind this dam. Jordan and elsewhere, thus validating the RUSLE model. Conservation, Vol. 24, No. 4, 1969, pp. 144-147.
for Soil Degradation Assessment,” FAO, Rome, 1979. 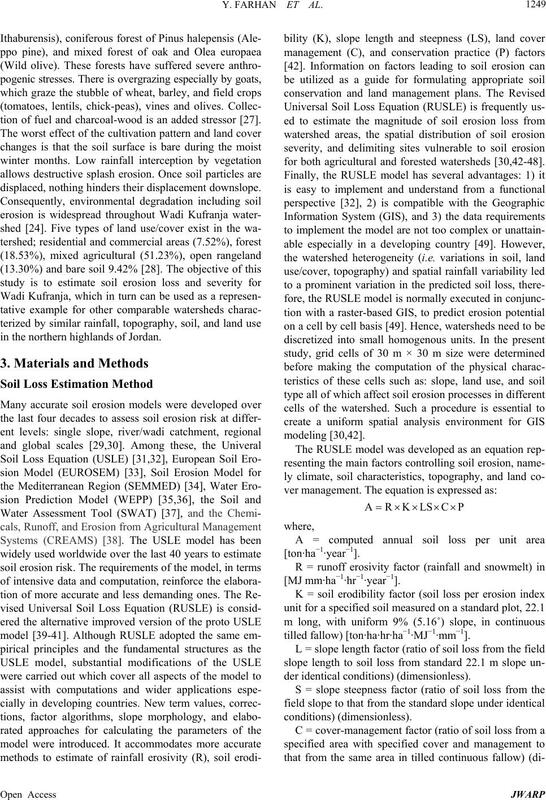 R. Morgan, “Soil Erosion,” Topics in Applied Geography. Jordan,” M.A Thesis, University of Jordan, Amman, 1994. Jordan,” M.A Thesis University of Jordan, Amman, 1988. Springer-Verlag B.V., 2009, pp. 439-450.
cal Watersheds and Rivers, Istanbul, 2012, pp. 145-152.
logical Society, Vol. 114, No. 1-4, 1958, pp. 1-24. W. Fisher, K. Atkinson, P. Beaumont, A. Coles and D.
University of Durham, Durham, 1966. Economic Botany, Vol. 25, No. 3, 1971, pp. 305-311. Earth Science, Vol. 65, No. 7, 2012, pp. 2087-2102. R. Morgan, J. Quinton, R. Smith, G. Govers, J. Poesen, K.
Landforms, Vol. 23, 1998, pp. 527-544.
tely Sensed Data,” Catena, Vol. 37, 1999, pp. 291-308.
sion Research Laboratory, West Lafayette, 1995. Biological Engineers, Vol. 40, No. 4, 1997, pp. 921-933. Resources Association, Vol. 34, No. 1, 1998, pp. 73-89.
tural and Biological Engineers, Vol. 28, No. 4, 1985, pp. No. 3, 1994, pp. 213-220. 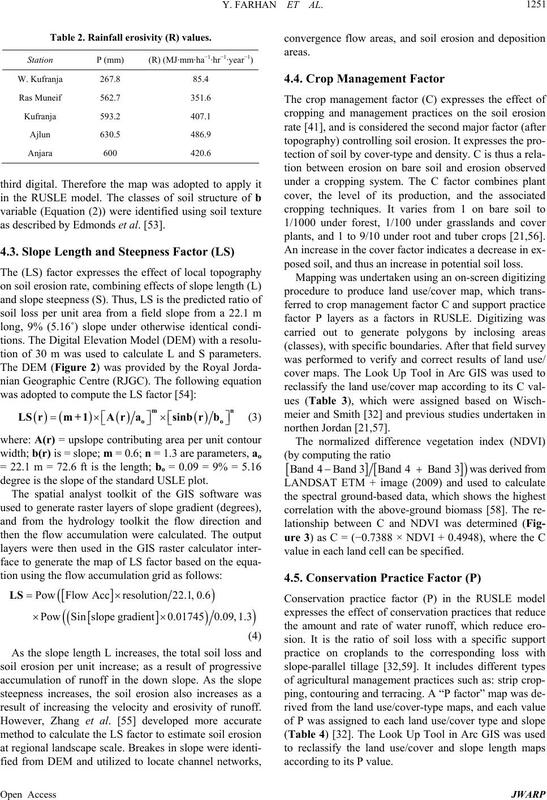 Soil Loss Equation (RUSLE),” Agricultural Handbook No. 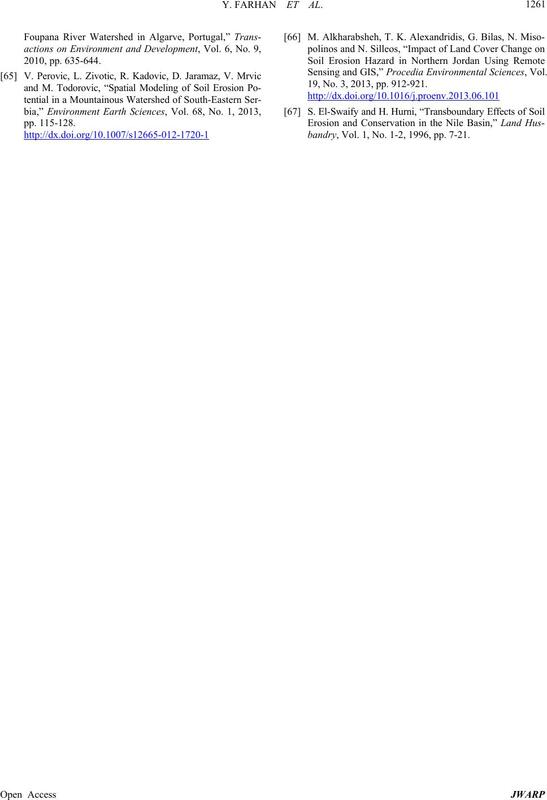 703, US Department of Agriculture, Washington DC, 1997.
ology, Vol. 57, No. 3, 2009, pp. 695-705. 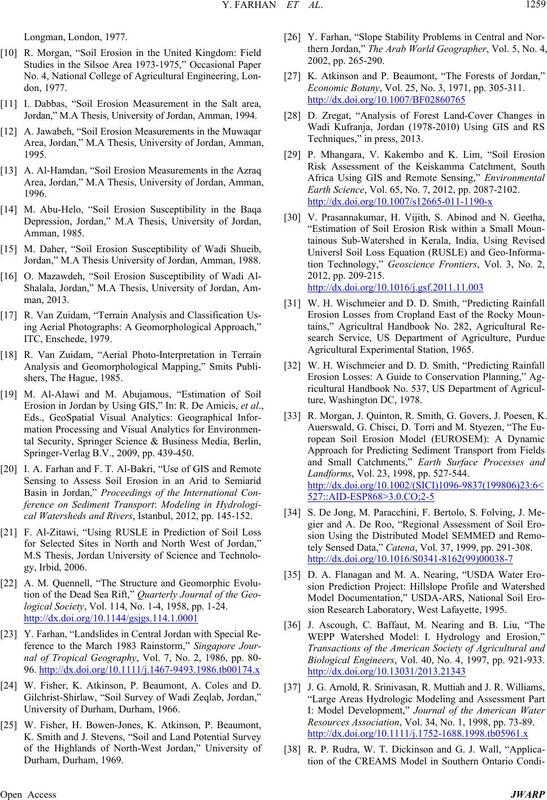 Tillage Research, Vol. 85, No. 1-2, 2006, pp. 38-49. 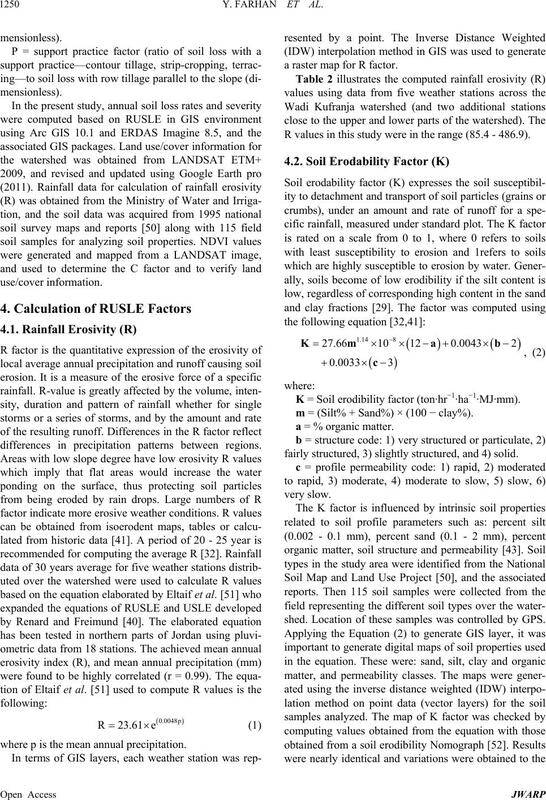 RS and GIS,” Environmental Earth Sciences, Vol. 59, No. Greece,” Environment al Geology , Vol. 57, No. 3, 2009, pp. 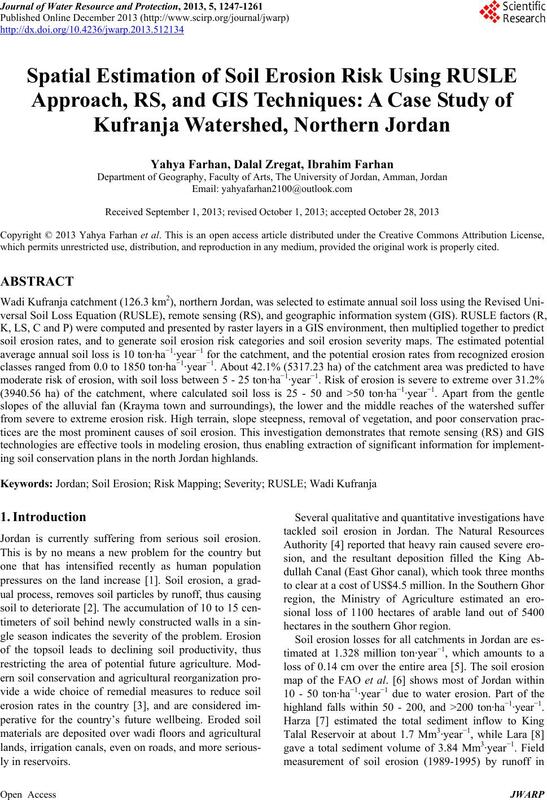 Water Resources Management, Vol. 25, No. 14, 2011, pp. Watershed,” CATENA, Vol. 38, No. 2, 1999, pp. 109-129. N. I. Eltaif, M. A. Gharaibeh, F. Al-Zaitawi and M. N.
in North Jordan,” Pedosphere, Vol. 20, No. 6, 2010, pp. servation, Vol. 36, No. 6, 1981, pp. 355-359. W. J. Edmonds, P. G Thomas, T. W. Simpson and J. C.
Land Judging and Soil Evaluation, Blacksberg, 1998.
mation Systems, Vol. 10, No. 5, 1996, pp. 629-641.
and Geoscences, Vol. 52, No. 1, 2013, pp. 177-188. UN/FAO Soils Bulletin 70, Montpellier, 1996. United Arab Emirates University, Al-Ain, 2004. Congress of ECSSS, EUROSOIL, Bari, 2-6 June 2012, p.
No. 10, 2013, pp. 108-124. 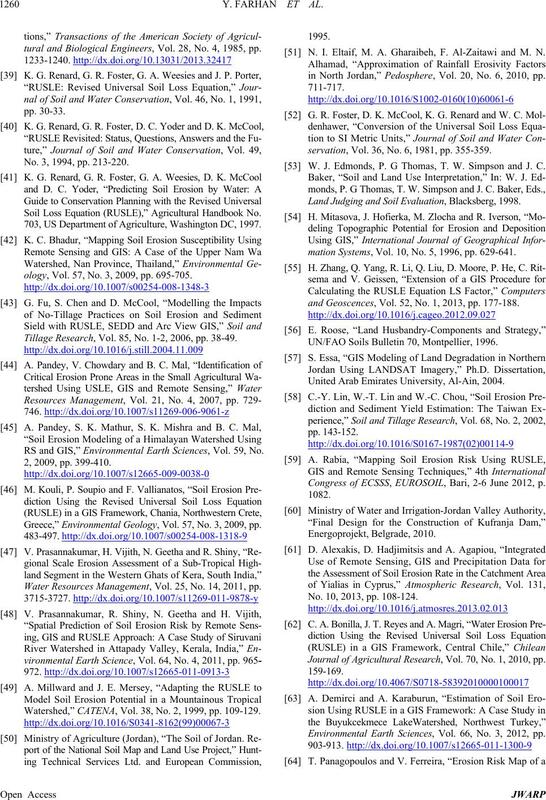 Journal of Agricultural Resea rch, Vol. 70, No. 1, 2010, pp. Environmental Earth Sciences, Vol. 66, No. 3, 2012, pp. Sensing and GIS,” Procedia Environmental Sciences, Vol. 19, No. 3, 2013, pp. 912-921.
bandry, Vol. 1, No. 1-2, 1996, pp. 7-21.